Sweet 16? Not So Much. A week or so ago, I realized this blog is not my first foray into writing about friendship. During my junior year of high school, I bought one of those cheesy black and white photo books called “Girlfriends” for my BFF Callie. It was, if I remember correctly, filled with beautiful pictures of different sets of friends, accompanied by the stories of their friendships. Full of aspiring literary prowess even then, I pasted a picture of Callie and me in the last page and wrote our story. At this point you’re probably thinking “Awwww, what a sweetheart she was! 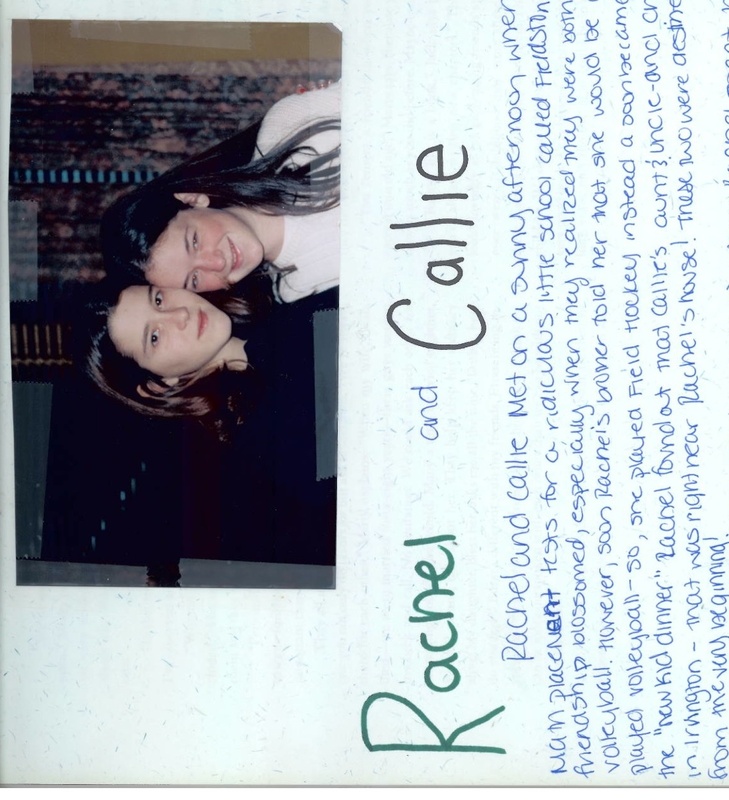 Appreciating the value of a true friendship even at 16 years old!” That’s certainly what I thought when I patted myself on the back and asked Callie to send me a copy of the story so I could post it on this very blog. When I look back on high school, I remember the group of mean girls. I was not one of them. In my rose-colored tainted memory, I was a bit player in the social ladder that was teenage life. So you can imagine my horror when reading this. Granted, those “jokes” (and I put that word in quotation marks now, as I can see them for what they were – attempts by a totally insecure teenager to deal with her own crazy issues – but I really think back then I didn’t realize the nasty undertone they carried) were sandwiched between the early line of “These two were destined to be friends from the very beginning!” and the closer, “Rachel and Callie are best friends because it seems that they often share a mind. Rachel is sure that they will be friends forever.” I still stand by that. So today, instead of oohing and aahing over what a sweetheart I was, I spent the entire day embarrassed by my behavior 11 years ago. I told myself we all are idiots at 16 and Callie knew I was joking—we shared a brain after all. I know she hasn’t held it against me (in fact, I’m fairly confident she hasn’t thought about it much since. She seemed genuinely surprised by some of the other not-fit-for-print lines of the story) because she’s held onto this book, and stood by me—literally, stood next to me – at both my wedding and my father’s burial. Through good times and bad. Always. Still, I called her three times tonight to apologize for my 16-year-old self. We played phone tag and never connected. I sent her an apology email. I know she will write back tomorrow and say that I’m being crazy and have nothing to apologize for and assure me that none of us were at our best at 16. She’s that kind of friend. Have you ever looked back at something you did or said to a friend years ago and felt ashamed or embarrassed? Do you think we edit memories to display ourselves in the best light? Is it ever too late to offer a heartfelt apology? And, when it comes down to it, are all 16-year-olds just insecure nitwits? callie is a good bff– i know from experience! I still remember, in high school, when I was a senior and my best friend (a junior) and her sister (also a senior) planned a party while their parents were out of town. I helped with all the planning and all we talked about for at least a week was this party. The day before, I called my bff on what to wear, and she told me, “We aren’t inviting you, because you don’t drink and wouldn’t have a good time.” I was CRUSHED. But we still stayed friends – just not as close. And yes, I remember (with A LOT of cringing and never have shared this before) being the mean girl. I would like to find her (and I can’t even remember her name) to apologize. To this day, I am sad for her and mad at myself for being horrible. It was only for about a week, but still… Sigh….. This post is hilarious — and so familiar. A junior high friend and I kept a journal we swapped often throughout the school day, and when I read some of the entries years later I was completely mortified. We spent just as much time slamming the “popular” girls as we imagined they spent making fun of us. As you say: it’s insecure behavior, and probably for most people as much a part of adolescence as suspect fashion choices. It’s a relief to know I’m not alone in my rose-colored remembrances! Such a great post! My BFF’s and I were literally reading through the yearbook on Saturday and were horrified by how mean all the notes were! Hilarious…but MEAN. In my early twenties, I reached out to an old friend and apologized for some nasty 13-year old behavior. She thanked for me for the apology but she had no interest in being friends again. I don’t blame her, but it kind of sucked. 16 was such a hard age. I can’t remember doing anything horrible, but I do remember sitting by, watching other people do horrible things. Which is so totally lame. Years ago?? How about last week? I’ll look back at an email I sent a friend, or my husband and realize how transparent I am, even when I’m trying to send some veiled message. It’s never veiled. It’s always transparent. That’s why I should always delete the contents of my sent box. I know I edit memories. I create nostalgia where there should be none. If I were to open the box of old notes to my childhood BFFs that’s currently in a closet at my parents’ house, I am certain I would be mortified at the things I wrote, because I was never very good at saying anything other than exactly what I was thinking and tact was never my strong suit. I have said and done things far more horrible than that! 16 year olds are not known as being filled with tact. At least you didn’t steal her boyfriend. That’s true… I did no man-stealing. That should definitely count for something. Thanks! I have a box at my mom’s house full of old notes, of the passed variety, from high school. Every once and again, I’ll read one and feel like the world’s biggest drama queen. Everything was HUGE and little offenses were the END OF THE WORLD. I managed to lose my BFF for a few years over ridiculous junk; she went to college and I was in still in high school. A little animosity made staying in touch unlikely. Luckily, I made an effort a few years later and all was fine. Still BFFs, though a few states apart.